I am a keen Formula 1 fan and have always wondered what it would be like to drive one. Although There have been some PC and Games console racing games about, none that I could see were as real as they should be. As a dedicated Microsoft FSX flight simulator flyer I was certain that at some time a good driving simulator would come along. F1 2010, F1 2011, F1 2012 and F`1 2013 now IMHO fill that gap. HOWEVER sitting in my office chair with a steering wheel bolted to the desk lacked that nod towards realism that such good graphics and game play demanded. Inspired by several sources, mainly the Playseat RBR 1 http://www.playseat.com/en/playseat-f1-race-simulator-launch HOWEVER the Playseat RB1 costs £920+ !! rather out of my budget range. I decided to build my own. As I have entered this instructable for a contest I have had to replace all of the images from the internet with my own images. Not as nice but the original inspiration can be seen at the address above. 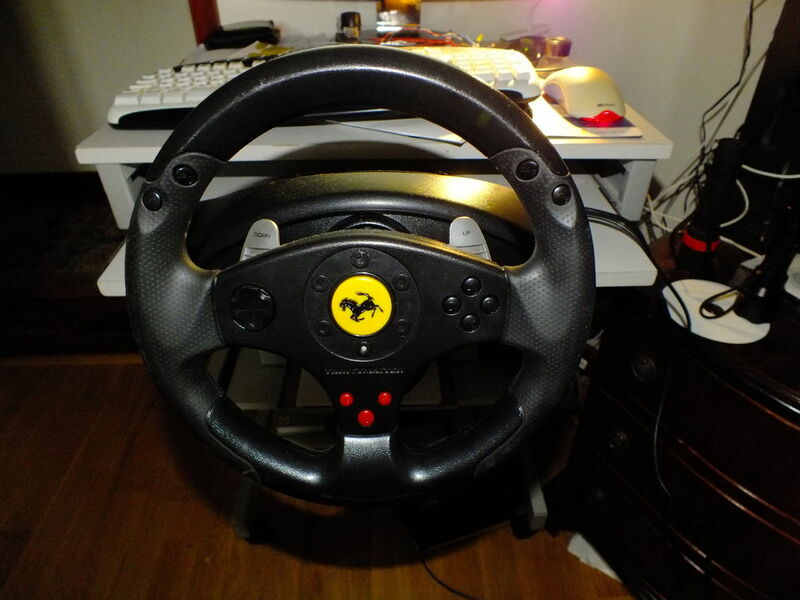 A suitable steering wheel and pedal set for your PC or console. Looking closely at the pictures I decided the chassis was essentially 2 side plates, a seat and the mounting for the pedals and the steering wheel. I drew my version of these in my CAD system - printed them out and traced them onto 18 mm MDF. The shape is very easy to draw free hand once you have an idea of size. This I cut out with a jig saw (skill saw) and smoothed the edges. i have added an overall view with the measurements in inches these ar taken from that scaled drawing and may not be exactly the same as the mm drawings here but close enough. I made a seat from a scrap of 12 mm Ply wood with softwood sides. The dimensions to suit me were around 500 mm square for both the back and base of the seat. The side were shaped to suite. The seat is screwed to an MDF box which is in turn screwed between the side rails. I considered making the seat adjustable bu cutting a slot in the side rail and bolting through the seat but decided this wasn't necessary. As an experiment I tried a fiber glass seat I have for my recumbent bike, (see pictures), but found that the seating position wasn't comfortable after a while so returned to my simpler ply wood seat. Step 4: The Pedal Fitting. I was fortunate in that my Pedal set has 2 6 mm bolt holes in the bottom to attach to a base, I use these to attach it to a suitably sized piece of MDF. A further rectangular piece of MDF was screwed between the side rails at the front to support the pedals. This was screwed to the MDF on the pedal set. This needed to avoid obstructing the seating position, that is I needed to be able to get my knees under the wheel and at the same time be in a comfortable driving position. After some trial I ended up with a sweeping MDF column with a platform mounded on top to take the wheel. In order to make the column strong I sandwiched two pieces of MDF together. To fix in the side frame the column was screwed to a box that just fitted between the side frames. This box was bolted to the side frame with an 8 mm coach bolt on each side which fitted through a slot in the frame to make the column position adjustable. I made the column adjustable forwards and back and by tilting up and down by cutting an 8 mm slot in the side rail to take an 8 mm coach bolt. This way the angle and the distance of the wheel could be adjusted. Step 6: Trying It Out. Seated in front of a wide screen high definition monitor gives a definite extra element to the game. It feels more solid than bolting the wheel to the desk and also somehow makes you more part of the game. Neighbors give you a funny look when they come round though. The unit is not too heavy to carry in and out of the house (my wife won't allow me to keep it in the house), and given a decent paint job should look quite professional. Next stage is to give it an authentic paint job in my favorite team colors. The pictures below show the initial build prior to modifying it as described in this instructable. Pardon my cleaning out the untidy background as the pictures were taken in my garage. The file should be a DXF file showing all the measurements I used. This is a PDF and Jpeg version of the drawings. That's about the best I can do folks. I open the dxf fine, however. You can easily draw the shape of the sides with a ruler and pencil using the measurements I give, or some you can make up once you understand the principle - No need to make it look like this. The rest is just rectangular sections to space the side. Hi! I have some problems with dxf Files! I can't open it with any software? Do you alreay solved it? Thanks for putting it in inches. You didn't have to, but you saved the U.S.A. a bit more time. Ironic you posted this today. I too have desired the playseat, but with a $900 price tag, that's a good portion of tax returns. Thanks for the awesome plans. Are all the dimensions in MM, as I live in the states so I will have to convert them when I go to recreate. Also is the seat adjustable on a slider for multiple users? The seat position on mine is fixed and most adults can fit into it. - It could be adjusted by unscrewing the seat support and moving then re-screw. Making it more easily adjustable wouldn't be a big deal though. I have added a drawing with the dimensions in inches. The driving position feels strange at first - but you get used to it. At present it is dismantled awaiting a reorganisation of the garage. Storage is a problem with something this size. Nice job on the construction! Have fun.